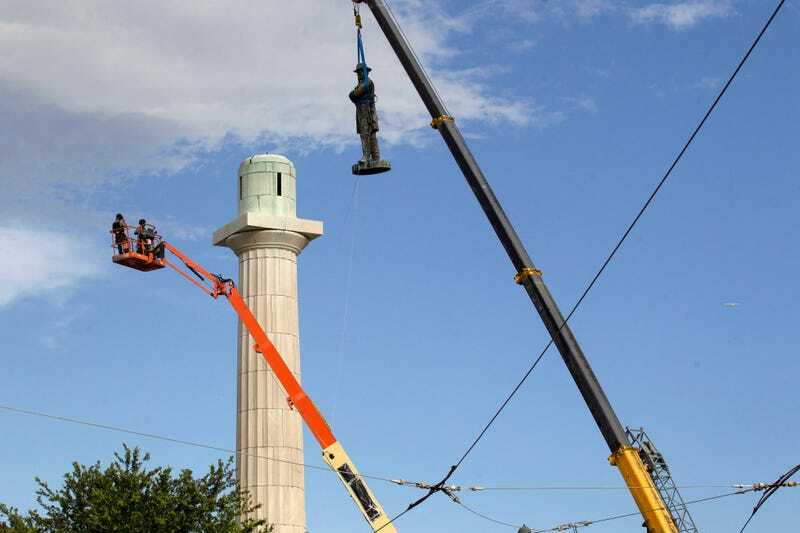 A crane removed the final homage to white supremacy in New Orleans on Friday when the statue of Confederate Gen. Robert E. Lee was removed, the last of four Confederate monuments to go down. The New Orleans City Council voted 6-1 to remove the monument and three other Confederate and white supremacist monuments in December 2015, just months after a white supremacist gunman with a penchant for Confederate flags walked into a Charleston, S.C., church and gunned down nine innocent black people. An obelisk honoring the militia known as the White League was taken down in April; a statue of Confederate President Jefferson Davis was removed May 11; and a statue of Confederate Gen. P.G.T. Beauregard was taken down Wednesday. The sites of all four monuments have been sites of heated contest, with 24-hour vigils held by so-called patriots on one side, flanked with guns and Confederate flags. On the other side were those who were happy to see the statues go, holding African liberation flags and signs saying good riddance to white supremacy. With the exception of Lee, the monuments were taken down in the darkness of night, to avoid physical confrontation with the workers involved in their removal. Since the beginning of the process, city officials, activists, contractors and work crews have been threatened and harassed. The Post reports that a contractor involved pulled out of the job after an arsonist set his $200,000 Lamborghini ablaze.